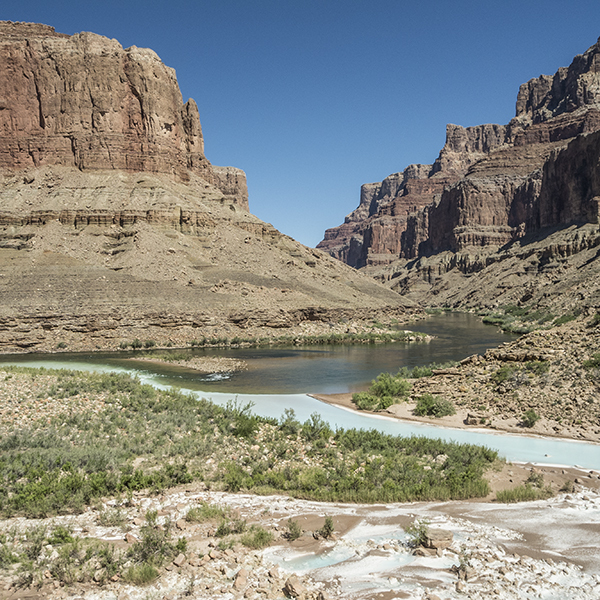 See where the turquoise waters of the Little Colorado River mix with the main stem Colorado on this route to the confluence. Once known only to Native American tribes, the confluence of the Colorado and Little Colorado rivers has recently attracted national attention as a result of the controversial proposal to build a gondola to carry 10,000 people a day to this sacred area. It’s the wrong development in the wrong place, but there are several ways you can respectfully visit the confluence — one of which is on foot. It takes several days and a lot of effort to get there, but the multi-day trek is worth it. And you’ll come back with an understanding of the need to protect this fragile and amazing place. The Beamer Trail starts near Tanner Rapid and is not marked with a sign. Very generally, you’re looking for a well-trodden path that branches off to the east, but depending on the direction you’re coming from (down the Tanner Trail or up from the river), your route to the trail might look slightly different. Head east where you can, looking for cairns, and you’ll likely be on the right track. The trail climbs up the blocky Dox Sandstone, contouring in and out of tight drainages as you head upriver. You drop down to the sandy beach around 0.7 mile and continue slogging along the slopes, crossing two dry tributaries: Comanche Creek, followed by Espejo Creek. 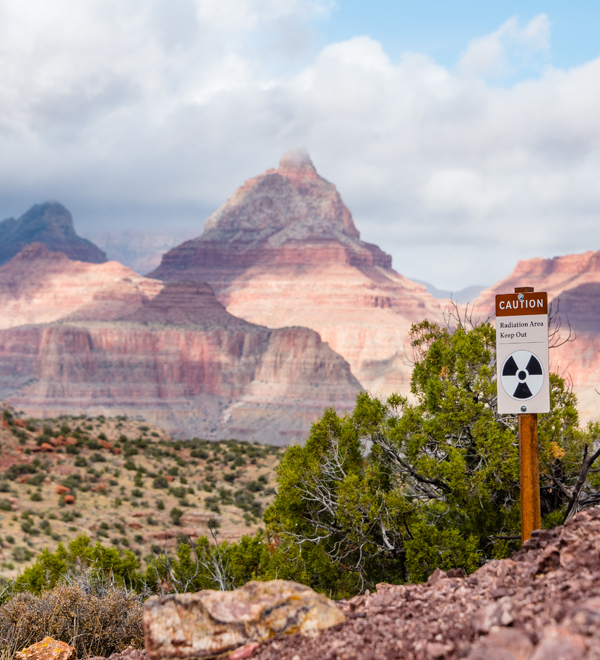 The trail generally keeps away from the brushy river banks, but around two miles, the deep red cliffs push you close to a side channel of the Colorado. Soon after, you’re forced up for a brief climb above the river. At three miles, you’re back on the flats and can see Lava Canyon Rapids off to your left. From here, it’s a straight shot to Palisades. Make sure you top off your water bottles here before starting the next leg of the hike — it’s a long, hot six miles before you’ll reach the river again. Get your climbing legs ready! From the canyon floor, pick your way up a steep rocky slope to the top of the Tapeats Sandstone. For the rest of the Beamer Trail, you contour along this shelf, 300 feet above the Colorado River. The miles drag on, but the exposed sections keep you on your toes. Narrow trails on steep slopes with small, loose rocks underfoot require your utmost attention. As you snake in and out of small drainages, look for cairns to guide you past the terraced amphitheaters. Approaching the confluence, you can start to see the aquamarine water of the Little Colorado River spill into the green Colorado (assuming neither is flash-flooding). And at 8.4 miles, look for a boot-beaten route branching off to a beach at river level. This is the only place to camp without retracing your steps. (Note: There is a no camping zone around the confluence, which starts just past this beach). To finish the hike to the confluence, keep straight at the junction. The trail gradually descends as it wraps around into the Little Colorado River drainage, and you end up on its banks. The confluence holds spiritual and cultural significance for several Native American tribes in the Southwest. For the Hopi people, the confluence represents their place of emergence. For Navajo, it is a place to pray and honor ancestors. The Beamer Trail starts at the bottom of the Grand Canyon near Tanner Rapid, so you’ll have to hike down the Tanner Trail to reach it (see the Tanner Trail guide here). Fee and backcountry permit required. Check the website below for current information.